Baby girl is close to 19 inches (48.3 cm), and she weighs around 6 lbs (2.7 kg). She was actually measured on an ultrasound I had last week to check amniotic fluid levels and they said she is measuring 5.7 lbs, but they couldn’t quite get her full leg so it might be closer to 6 lbs. She is about the size of a papaya! Painful Braxton Hicks. And by painful I don’t actually mean that I was in pain! but noticeably crampy Braxton Hicks which I’ve never experienced before, typically it’s just tightening without the cramping. I had 2 days in a row of them when I was 36 + 1 and 36 + 2 days pregnant. On the first day of them I had cramps straight for 2 hours every 5 minutes. I have no idea where they come from however I did overdo it that day just in terms of rushing from one place to the next and hiking with Forest on my shoulders so maybe that’s what did it! Mark was well and truly in the middle of his week in Vancouver so I’m so glad they petered out into nothing! I’ve been enjoying them though because I know it’s only preparing my body for labour. I’ve had a pretty cruisey week to be honest, despite having no husband here and zero kitchen amongst the debris of renovations. Having said that, I did have “one of those days” on Thursday (the day of the cramping) where everything went decidedly wrong. I started my morning at Bodhi’s swimming which ran over, so it meant I was late picking up Forest from ELC which in turn made me late to my 36 week midwife appointment which in turn made me late getting to my chiro appointment. I packed my birth centre bag! I finally got around to packing a bag for the car and a bag for the birth centre, which has made me feel much more organised. 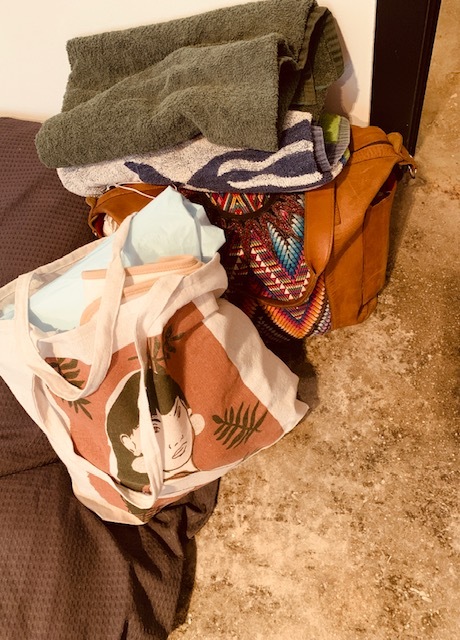 Typically, at the birth centre you arrive for the birth and then you’re discharged within a couple of hours, so I didn’t need to pack for an overnight stay but as birth is so unpredictable, I did pack one spare change for the baby and I. 3 pairs of full brief underwear. Perineum post birth soothing spray by Earth Mama. 2 outfit changes for myself; easy soft nursing bras, trackies, over sized tees and a woolen cardy, slip on shoes. Bose speaker for birth music. hand knit baby blanket made by my friend Kate. The going home outfit Bodhi picked out TWO years ago! He was certain he’d have a baby sister one day, so I bought the outfit just in case and only remembered it as I was packing for Australia a couple of months back! It’s very sweet that we get to use it. The second outfit is her first photos outfit that Mark and I selected together. We chose a custom made wooden name plaque by Zilvi, ruffle bloomers by Lulu and Milly, a rust coloured ribbed summer romper by Bonnie and Harlo, and the cutest little nature crown designed and especially made for us by Nature Crowns, with little dusty pink socks given to us by Lara Worthington, woolen cream and pink booties made by our favourite Adelaide granny from the Lobethal Lights and a spare floral cotton blanket by Lulu and Milly and a little cashmere beanie that was a hand me down from friends of ours. SO sweet. Aden and Anais burpy cloth. a hand me down spit up bib. I had a VERY fast labour with Forest. 3 hrs 20 mins from the very first twinge. I was 9cm dilated when I got in the car to make the 35 minute drive to the hospital. My water broke en route, and I started pushing while still in the car as I arrived at the hospital... SOOO this time I want to be more prepared in case she decides to come fast furious like her big brother! 144lbs/65kg. Officially the heaviest I’ve ever been in pregnancy! I’m up 3 lbs from where I was during my pregnancy with Bodhi at the same week and up 2 lbs from where I was at with Forest. Funny that my body just seems to put on about the same amount of weight each pregnancy. I went to my usual weekly F45 class, plus all the running around on my disaster day! Chilling out on the chocolate croissants, but had a few cinnamon donuts this week only because I was celebrating the end of the Fringe, of course! Dumplings, veggie burger and fries, pizzas and garlic bread, chia pudding and granola, chocolate protein smoothies, green juices, and smashed avocado sandwiches. My ice craving has severely dissipated since I became less anemic. I also think the lack of kitchen hasn’t helped because I don’t have the same level of access to ice as I had before. No specific cravings really this week! I had a pregnancy photo shoot with the divine Melissa Jean Babies (insert Instagram here). She was so wonderful to meet in person, what a dream boat and her photos are just divine. I can’t wait to share more. I know I’ll always cherish the moments she captured of myself and the boys in these last few weeks of it just being us.